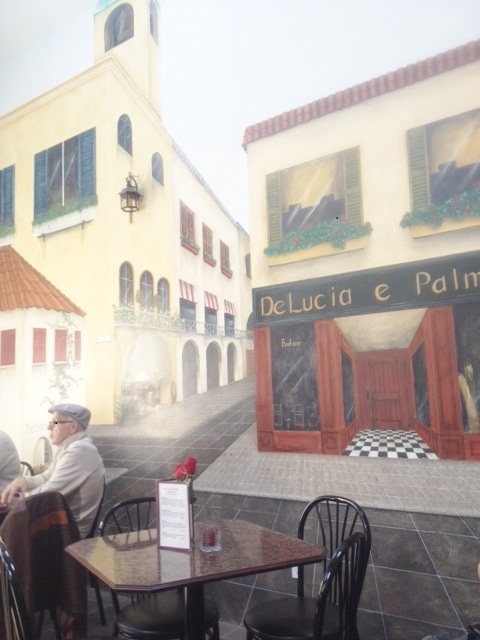 The trompe l’oeil murals make you feel like you’re in Italy. “April is the cruelest month,” according to T.S. Eliot, and the weather has certainly borne that out, with a couple of warm days followed by cold and rain. 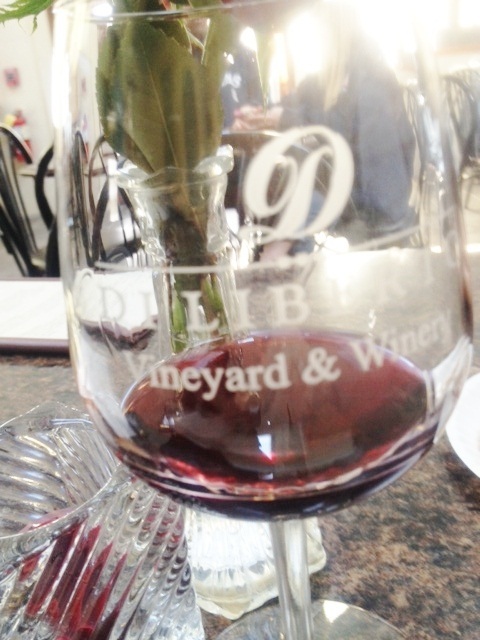 Today is at least sunny, though a bit on the cool side, as we head over to Diliberto’s Winery, one of the places we’ve been to fairly frequently, though not recently. We look forward to sitting in his cozy tasting room with its trompe l’oeil mural of an Italian street scene, listening to Italian opera, and pretending we’ve gone to warm sunny Italy for a day. The room is presided over by Sal Diliberto himself and his wife Maryann, though Sal is in and out of the room as he ducks into his big kitchen to prepare his homemade pizza and other treats. A table of wine club members is getting wines by the glass and two pizzas for a late lunch or early cocktail hour treat, and we know from past tastes that the pizza is good, with a crisp thin crust and fresh ingredients ($15, and there’s also a cheese platter available). Sometimes, especially in the winter, Sal (also a lawyer, with a practice in Queens) has held cooking classes, showing a room full of tasters how to make pizza, pasta, or gnocchi. He calls this “Sunday with Grandma,” though HE is “grandma”! In the past we’ve also liked his wines, especially his reds, which tend to complement Italian food very well (no surprise). However, this time our response is rather mixed. Perhaps he’s had an off year or two, since we were last here in 2011—though he does recognize us. The drill here is to order at the small bar, then sit at one of the ten or so tables—more in the summer, when the patio is open—and wait while the server brings each glass. The menu lists four wines for $12, and/or two premium wines for $9, and we opt for one of each, and I’ve marked the premium wines with *. 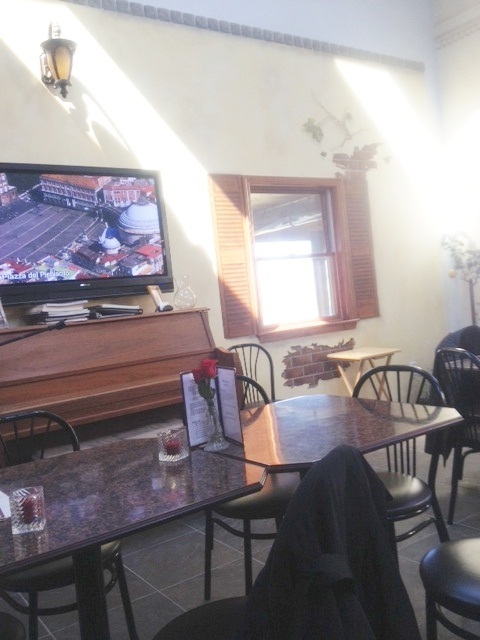 As we sip, we listen to Sal visit with the customers, many of whom are clearly regulars, and to recorded opera (sometimes Sal himself sings, or has a performer in) and watch “Visions of Italy,” a public television show that features aerial views of the cities and countryside of Italy. One could be in a sidewalk café in an Italian village, especially when he emerges from the kitchen with freshly made pizzelles, a little free treat. An aroma of wet cardboard and acetone greets our nostrils, but we hope the wine tastes better than it smells. This is a very tart, lemony chardonnay, with some notes of unripe pineapple, making it a tough chardonnay to like, though it would probably be okay with oysters or with seafood in a rich white sauce. Wines are served in good glasses. A blend of three wines—hence the name—including 65% merlot, 20% cabernet sauvignon and 15% cabernet franc, this should be similar to a Bordeaux. We had really enjoyed the 03 Tre, so we had high hopes for this one. Eh. Brambly aroma, some earthiness, a taste of prunes, some tannin. Hmmm…is wet laundry a wine word? Because that’s what this wine smells like! It is dry, with some blackberry, but would not enter the pantheon of great cabernets, especially as the finish is somewhat sour. We’ve liked Cantina in the past, as it is a good Italian table wine, a blend of half merlot and half cabernet franc. A few years ago we signed up for a barrel tasting with Sal and found ourselves and our guests—my brother and sister-in-law—as the only customers. We got into such intense and interesting conversations about wine that my notes stop after the first barrel, the 07 cabernet franc, but we really liked that. However, we find this Cantina somewhat on the thin side, with some earthiness, some tartness, and some fruit. It would be better with pasta than as a sipping wine. The tasting menu proudly proclaims that this is a New York State Gold Medal winner, and indeed it is our favorite of the wines we’ve tasted so far, despite a definite aroma of acetone again. We note a good berry taste, nice legs, and not much tannin. It also seems to get better as it sits in the glass, and we like the second taste better than the first. This wine would also, we decide, be better with food than as a sipping wine, as it lacks some of the richness and depth one expects from a syrah. The aroma is metallic, and I taste pomegranate. However, we opt to buy a bottle of this and one of the Cantina, as buying two bottles means the tasting is free, and we often need reds to go with Italian food. Reasons to visit: Sal’s cooking and the chance to chat with him about his wines or food or any other subject; a pretty tasting room; opera instead of the usual folk/rock/jazz music; the 2002 Merlot. An apple orchard is right down the street, and we highly recommend both their apples and their warm cider. One note: prominent signs indicate No Children and No One Under 21 Allowed, so be forewarned. The piano is not just for show, but gets used by performers. Having a bachelorette party? Then this may just be the perfect spot for you. 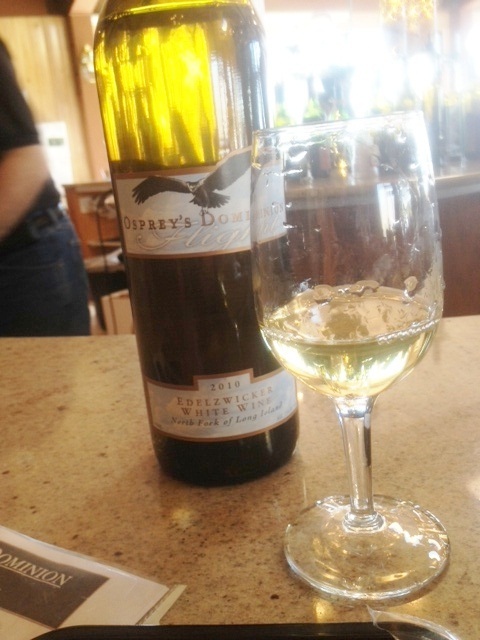 We saw at least five during our tasting at Osprey’s Dominion, and our server noted, “I need a drink. I just served three bachelorette parties in a row.” The first part of the long curving bar in the large, airy tasting room is reserved for limo parties, and they get a “special” menu with four tastes, with choices winnowed to two in each category. One group we noted had a rather extensive cheese and cracker platter, but we weren’t sure if they were served it or brought it. A guitar player in one corner varied his somewhat folksy play list to accommodate one group of women who danced in front of him. On the other hand, we liked many of the wines, and our server had his spiel on each wine well memorized, with useful notes on each, and was happy to make suggestions as to choices and the order in which to drink them. However, another server who took over for him when yet another group of gigglers demanded his attention just poured, with hardly any commentary. We felt somewhat abandoned at that point. A quick look at the gift items revealed a small assortment of not very creative choices, except for one neat idea: they will let you order a personalized label for some of their wines, though you have to order at least a case. The menu for those not from a limo offers two options (aside, of course, from buying a whole glass): $8.00 for any five from the menu, or $5 for three choices. A blackboard outside also offered a special of $20 for two tastings and a serving of sausage, cheese and crackers. The “serving” consisted of a small sleeve of Ritz-type crackers, and a pre-packaged box with slices of mild pepperoni and fairly flavorless processed cheese. Not worth it, but we were hungry after a shopping trip to Greenport and a quick stop at our marina to look at our slip for the coming summer (where we spotted two ospreys on their nest, which may have subconsciously influenced our choice of winery). As we frequently do, we ordered different wines so we could taste ten of their offerings, and so tried many of their wines (their website says they have 23, but not all are on the tasting menu). We did not try their sparkling wine, their port, or their spiced wine (served warm). Our server notes that this is a good place to start, as it is a fairly neutral wine. The aroma is somewhat flowery, and we note tastes of green apple and lemon. Good, and would be nice with oysters or lobster. “This one is more like a pinot gris than a typical chardonnay,” says our server, and we can see his point. Like other steel-fermented chards it has a mineral aroma and tastes of citrus, especially lime. The first taste on your tongue is a bit sweet, but it quickly turns tart. “This one just jumps out of the glass at you,” said our server, who will soon be moving to North Carolina to take a teaching job. This is certainly a Gewürztraminer that does its own thing, and does not taste like a standard wine from this grape. The aroma combines fermented pear juice and some cat pee (or like the smell of water that flowers have stood in for too long), but is not unpleasant. The flavor is both sweet and somewhat nutty, with a tart finish. It was interesting to taste this German-style wine next to the Gewürztraminer, since it has some of that grape, as well as Pinot Gris and Riesling in it. We really liked it, and it is an unusual wine for Long Island, which is always fun. The aroma is somewhat mineral, with a slight trace of cat pee, and it tastes like ripe green plums with some sweetness and complexity. It is certainly buyable, though we don’t opt to do so. 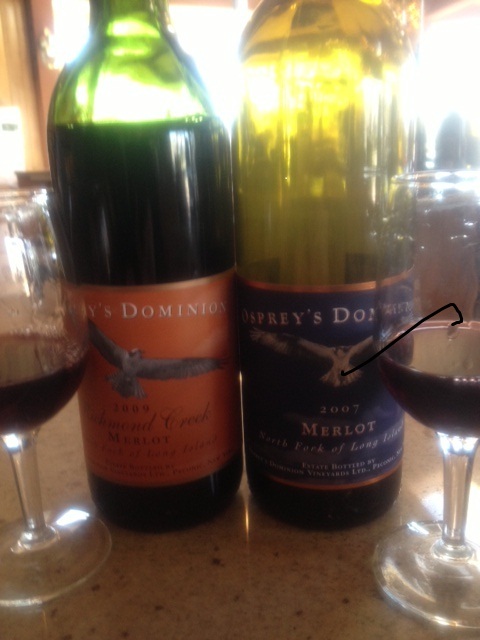 It’s so fascinating to find that two wines from the same grape and the same vineyard can be so different. As much as we like the 07 Merlot, that’s how much we dislike this thin, sour, very dry wine. It has no finish, which is fortunate, and I’d hate to have that taste linger on my palate. This one’s just okay, with mineral aroma and a whiff of earth, not much fruit and few tannins. 2008 was a very rainy year, and the cab franc suffers accordingly. Though we smell leather and plums, the wine itself is thin, with only a little fruit and not much finish. Somewhat of a Bordeaux blend, the Meritage has 67% Merlot, 17% Carmenere, 10% Petit Verdot, and 6% Cabernet Sauvignon. We like its aromas of dark cocoa and fruit, and it tastes good, too, with all the ripe fruit flavors lacking in the previous two wines. Our substitute server has to consult a notebook to give us the varietal breakdown. Really good! Lots of ripe berry aroma and plenty of fruit with no dirt make this a better than average Merlot—and they’ve priced it accordingly. Reasons to visit: Good for a large group, and very accommodating to bachelorette parties; they encourage picnickers in the summer to buy a bottle of wine and use the outside terrace while listening to music; the Flight Edelzwicker (called flight because the owner is also a pilot) and the 07 Merlot; good prices for most of their wines. But this is not the place if you like individual attention and a quiet atmosphere!